A dominant Seattle Sounders display saw the struggling play-off hopefuls thrash second from bottom Colorado Rapids 4-0 in a massacre at the CenturyLink Field. Despite the raft of tactical changes by Colorado manager Anthony Hudson during a weak first half, the Rapids never recovered and were ultimately put to the sword by a Seattle team looking to get back on form. 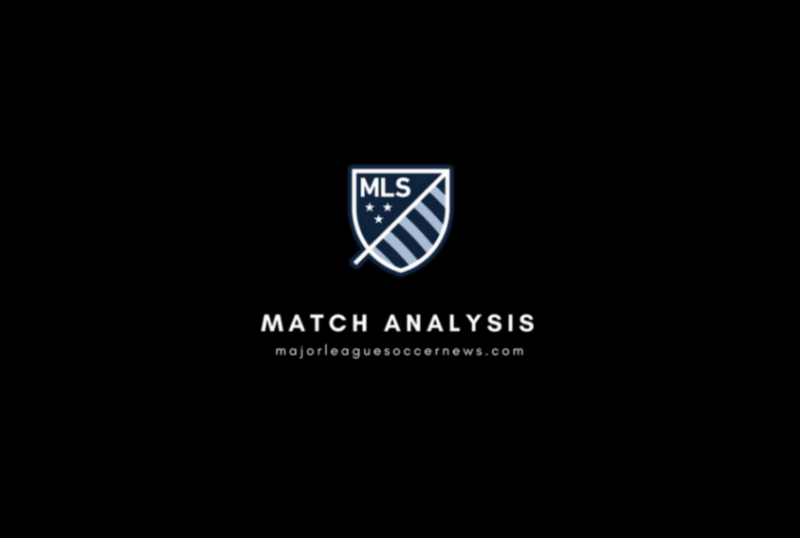 In this analysis, I will look at how Seattle carved open a weak and static Colorado defence in a brilliant attacking display from Brian Schmetzer’s team. After two consecutive defeats, which made Seattle’s playoff position look weak, Seattle built their victory upon their free-flowing attacks, which saw a lot of movement from their front four attacking players. Players like Raul Ruidiaz made themselves available all game, which ensured the player on the ball always had a pass on. This was evident from the first Seattle goal where Ruidiaz pulled away from the Colorado defenders to the edge of the six-yard box to smash home on the half volley, in a simple, yet brilliant goal. 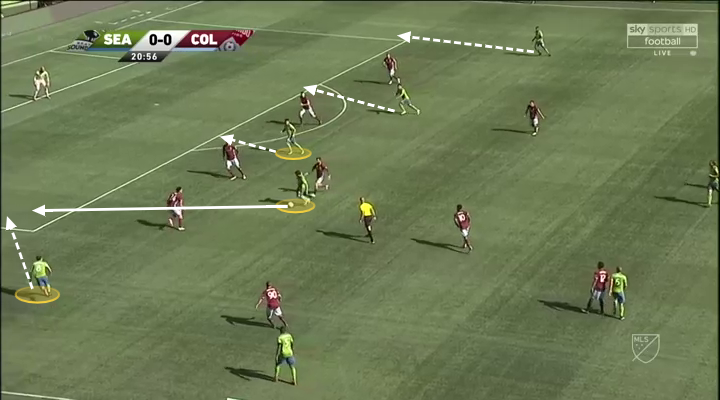 Attacking movement from various Seattle players, made life easier for the men on the ball all game. 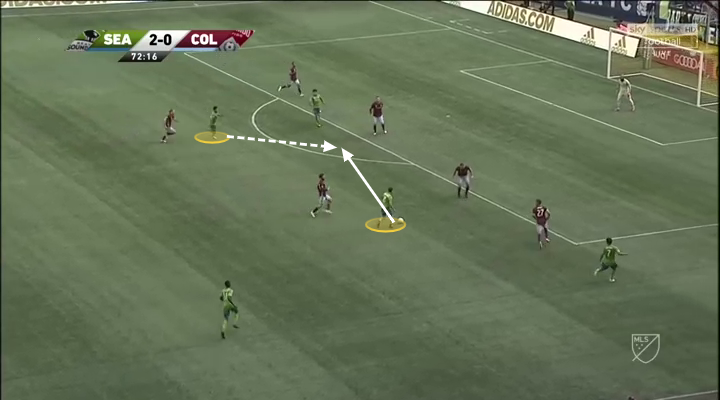 Despite being under pressure from a Colorado midfielder, the attacking movement outside Colorado’s defence enabled Nicolas Lodeiro to pick a pass. 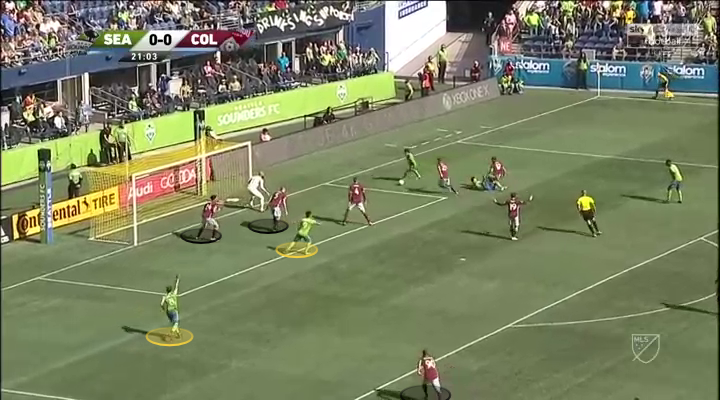 That was also a similar thing for Victor Rodriguez, who received Lodeiro’s pass, he had multiple men making movements away from defenders into open space. Raul Ruidiaz’ movement away from two defenders, to be picked by Lodeiro for Seattle’s opening goal. Further on in the attacking play from Seattle, Ruidiaz’ movement ensured an easy pick out for Lodeiro, who if he didn’t have Ruidiaz to pick out, would’ve had an easy chip to the back post for the unmarked Rodrigue to head in. This further strengthens the argument that Seattle’s attacking movement caused an admittedly static Colorado, problems all game. The movement continued all first-half and, like Atlanta a week ago, it beggars belief that Seattle didn’t go into the half-time break more than just one goal up. However, Seattle did continue from where they left off in the second-half adding three further goals, with two of them down to varying players making attacking movements. More attacking movement, this time from midfield, creates Seattle’s second goal. The movement of Ruidiaz and Rodriguez, which leads to Seattle’s third goal. For Seattle’s second goal a midfield run from Rodriguez was the catalyst in creating the goal. Rodriguez then ends up half way inside Colorado’s box, and in turn picks out Ruidiaz, whose brilliant movement away from the Colorado defender, Marlon Hairston, then sees him coolly slot the ball into the empty net. Seattle’s movement was the core aspect of a comfortable win in their crunch MLS game versus Colorado. 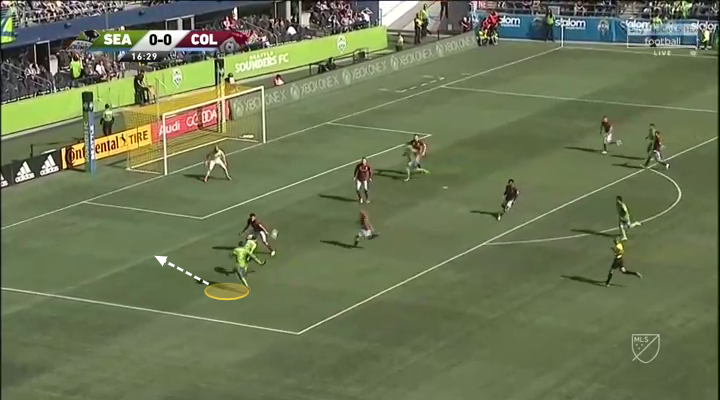 The front four of Ruidiaz, Rodiguez, Lodeiro and Roldan proved too much for a static Colorado defence and midfield, who were too often found standing still/ball watching rather than marking the free men in the box. 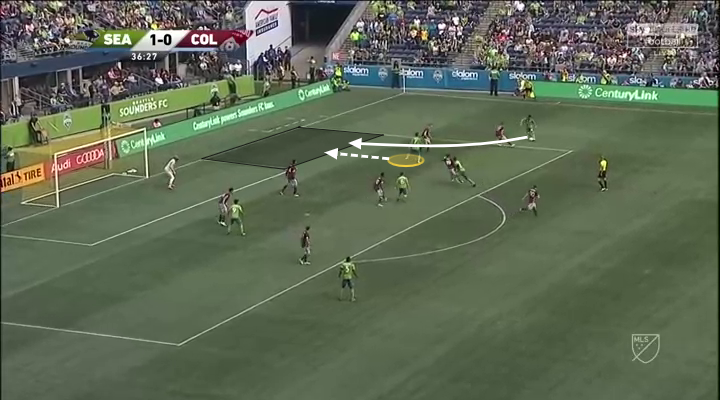 Along with the front four, the movement outside a narrow Colorado defence of Seattle full-backs Nouhou Tolo and Kelvin Leerdam, caused extra concern for Colorado, due to easy balls out wide which created easier crossing positions for Seattle. Two Colorado defenders fail to pick up Ruidiaz, who stepped away from them and swept the ball home for the first goal. The first goal conceded by Colorado highlighted the problems they had all game, where key players were left unmarked in key areas. 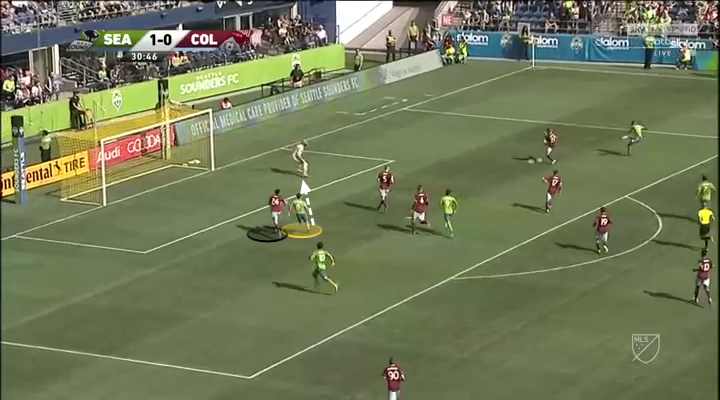 Even though the movement of Seattle was great, as highlighted in the above section, the marking is clearly atrocious, with not one, but two Colorado players letting Ruidiaz get a clean strike at Lodeiro’s pull back. Colorado maintained their poor defensive display throughout the first half and were lucky to find themselves only 1-0 down at the break. 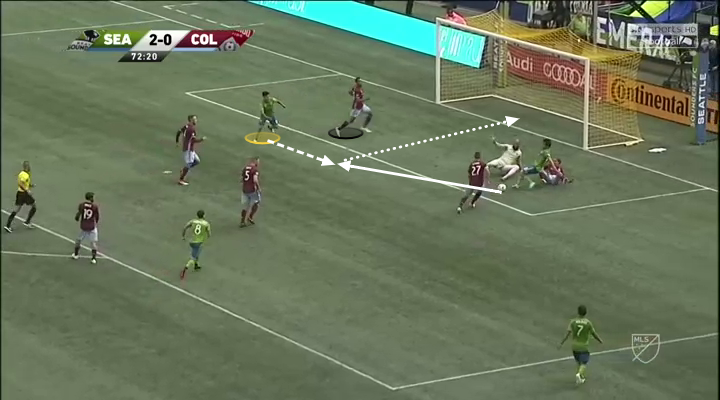 The Seattle attacking display meant that the Colorado defence was often very stretched, as Seattle had spare men popping up in key attacking positions. Seattle overlap ignored by Colorado’s midfield, which could’ve led to an easier chance for Ruidiaz, who is in the centre of Colorado’s box. A Colorado defender finds himself the wrong side of Ruidiaz, who is running in to attempt to touch home, Leerdam’s cross. Whilst Ford maintains touch tight marking with Ruidiaz, he still finds himself the wrong side of the Seattle attacker. There is also a run of Lodeiro at the back post not being tracked by Colorado midfielder’s who remain static, whilst watching the ball. A Colorado defender finds the wrong side of Roldan due to ball watching, which creates yet another chance for Seattle in behind their defence. The second-half for Colorado improved massively as they chased to get level, however after an unfortunate penalty decision, in which a Seattle attacker seemed to have tripped himself, Colorado fell further behind. The second from bottom Western Conference side, found themselves too high up the pitch as they looked to reduce the deficit, ultimately ending up in a 4-0 hammering against a back in form Seattle. Overall, Seattle maintained a consistent level of performance that saw their attacking movement cause Colorado problems all game long. The movement and passing of the ball stretched and pulled the Colorado defence all over the place, which in turn created space for attackers to pop up in all game long. This was evident for three of the four goals Seattle scored, where an attacker had either too much space or their run simply wasn’t tracked. If Seattle maintain this level of performance for their remaining regular season games, they are sure to pip their fellow play-off hopefuls to one of the remaining playoff spots. On the other hand, Colorado need a rethink going into next season, with their defence and midfield a key talking point for the club. Their static defending which saw them allow runners in behind/in between their defence is what has caused the club problems especially away from home, where the club have just one win and 12 losses. With nothing but pride left to play for Colorado, they can go out there and play with the handbrake off, which could lead to better displays going forward.